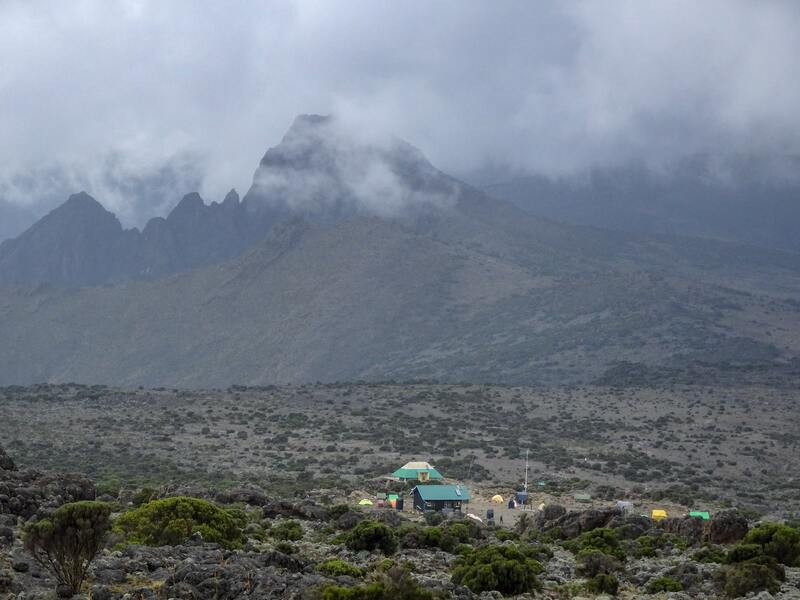 Our Day 2 had ended with a walk down from the ridge onto the Shira plateau and to our Shira 1 campsite (3504 meters). This day would see us gain another 400 meters in altitude as we walked across the gently sloping trail to Shira 2. It would be an easy day. 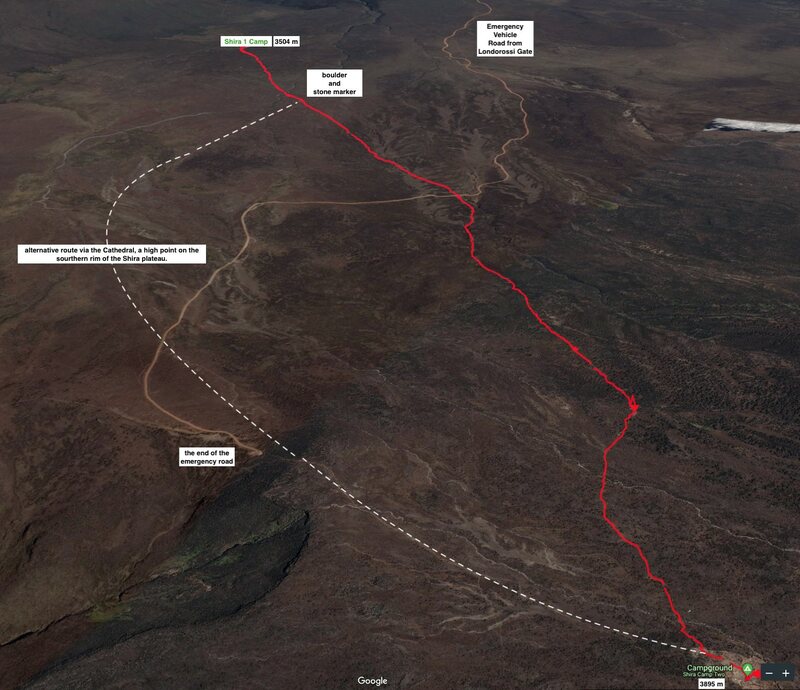 The red GPS track on the satellite image is the small section of the Kilimanjaro mountainside that we were traversing. 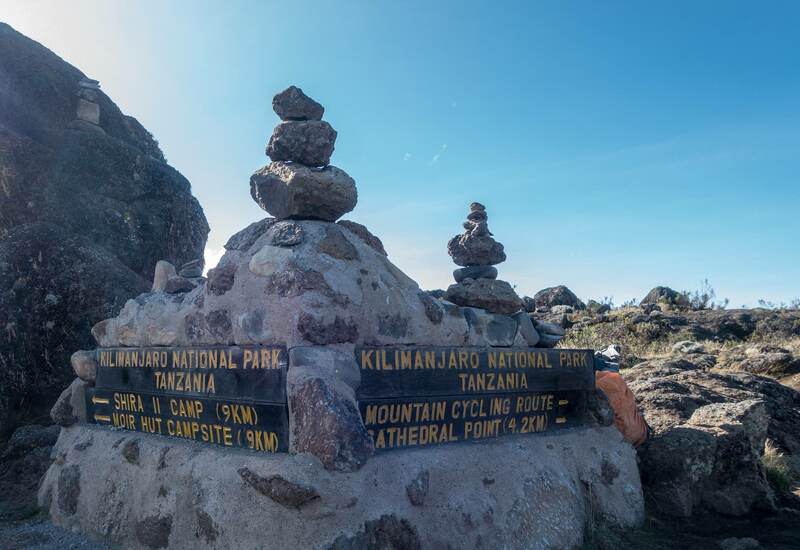 The track illustrates nicely that a successful Kilimanjaro trek is the result of a string of easy-to-achieve smaller goals. 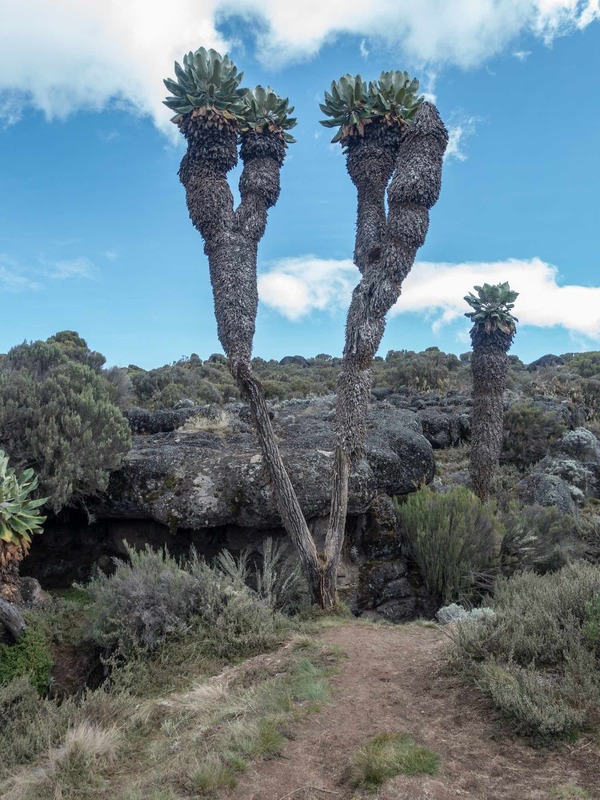 In our case, we had six days of moderate walking and acclimatizing to get ready for the final ascent to the rim of Kibo! 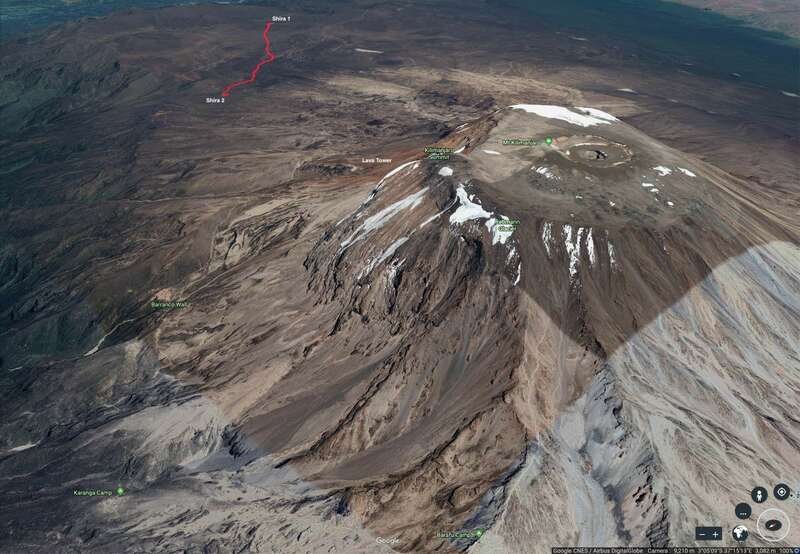 By Day 6 at noon we would be at Barafu, the spot indicated on the bottom and right of center. On this day we’d be walking about 8 kilometers, very close to what I walk my Icelandic sheepdog Viggo some days! I was up around 6:50, having had a good night’s sleep. It had been cool but I had been warm inside my bag. In fact, my biggest concern was the condensation on the inner tent walls. The next evening I would unzip the top of the front door and the rear window to allow some air flow through the tent. I waited just long enough to get my camera that by 7:14 when I snapped the photo below, it was too late! Instead of that nice red glow created by the sun behind Kilimanjaro, I got the full blast of white light. On the plus side, the top was visible! We left camp around 7:45. Looking back a few minutes later, I got the shot below of the park ranger’s hut and the tents of a few trekking parties not yet decamped. Less than an hour into our walk we came to a junction marked by a large boulder and another stone with signboards stuck onto it. To the right the trail went to Cathedral Point (3862 m); the main trail – the one most groups walk – goes straight ahead to Shira 2. Along the way, we passed an eye-catching giant groundsel on the side of a creek and somewhat sheltered by the boulders. However, as we gained altitude, the landscape started to look more desolate. The moorland was transitioning into the alpine desert terrain that we’d be walking in for the rest of the trek. We got to Shira 2 just before noon. 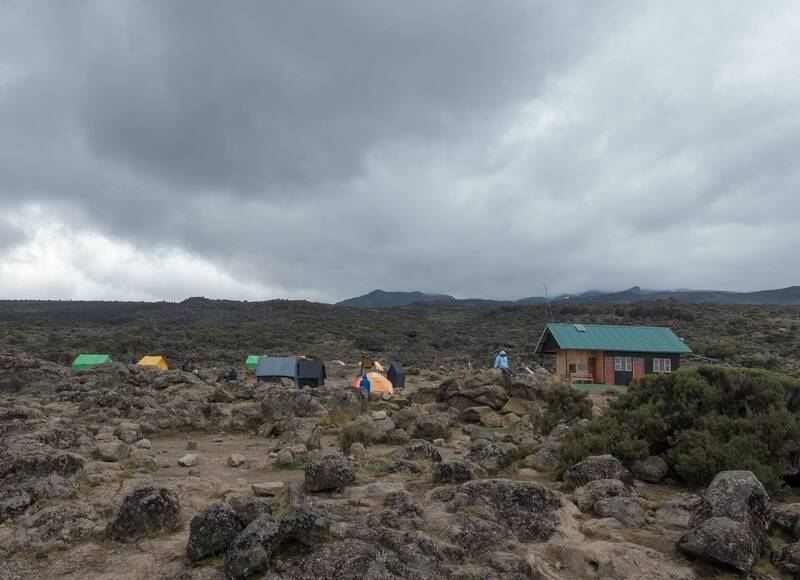 As was the case on Days 1 and 2, there were very few other trekking groups at Shira 2. The panorama below captures that desert alpine look. It also shows the last campsite that we would share with very few other groups. 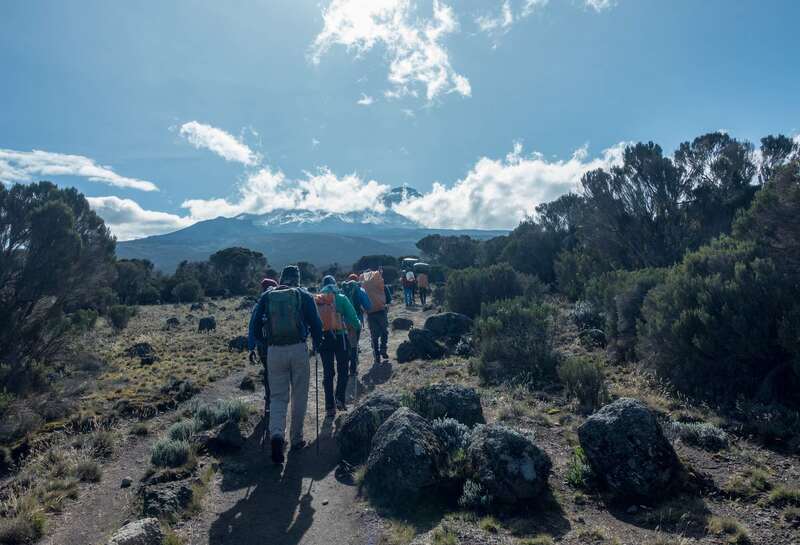 The next morning the Machame route trail would merge with ours and the volume of trekker and porter traffic would pick up significantly. Four tents for the five of us – and to the left, our own little toilet tent. Not just convenient but also kept very clean and odour-free! And to be fair, the Park facility pictured below, one of the new palatial models, was also well-taken-care-of. I also had a second Nalgene bottle which served as my pee bottle; it meant there would be no need to crawl out of the tent at 3:00 a.m. Most days by mid-afternoon the cloud cover hid the sun as the remaining images will show. Zoom in on the image of the Park toilet facility and you will see the notice – Tourists Only – pinned on the top of the center panel. 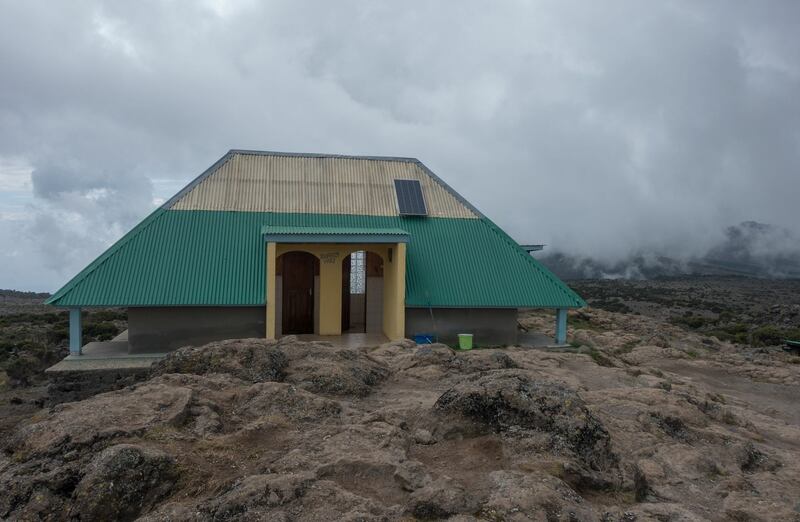 Every day on Kilimanjaro ends with a signing-in at the ranger’s hut. I guess it is to make sure that everyone remains accounted for. It more likely serves no useful purpose at all, other than to fill ledger books with illegible names and particulars that no one will ever actually look at. 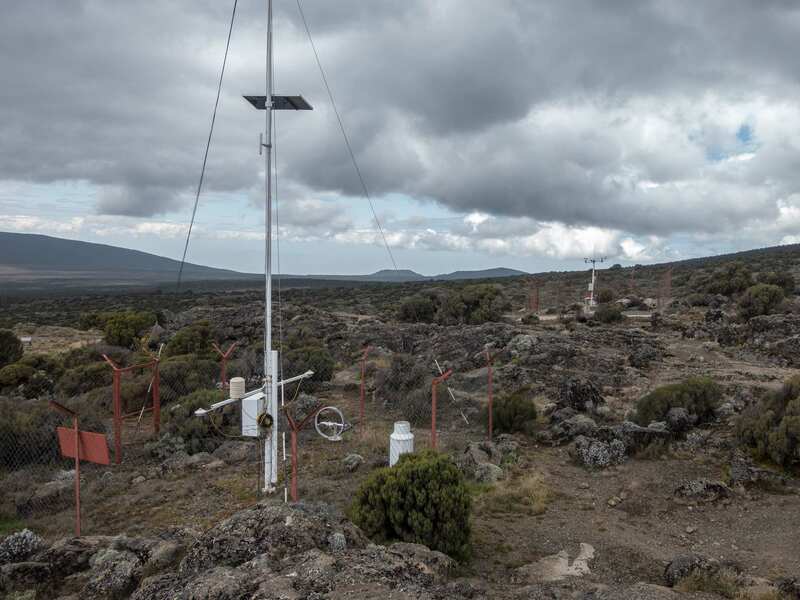 The Shira 2 site has an automated weather monitoring station enclosed in a couple of fenced-in areas. 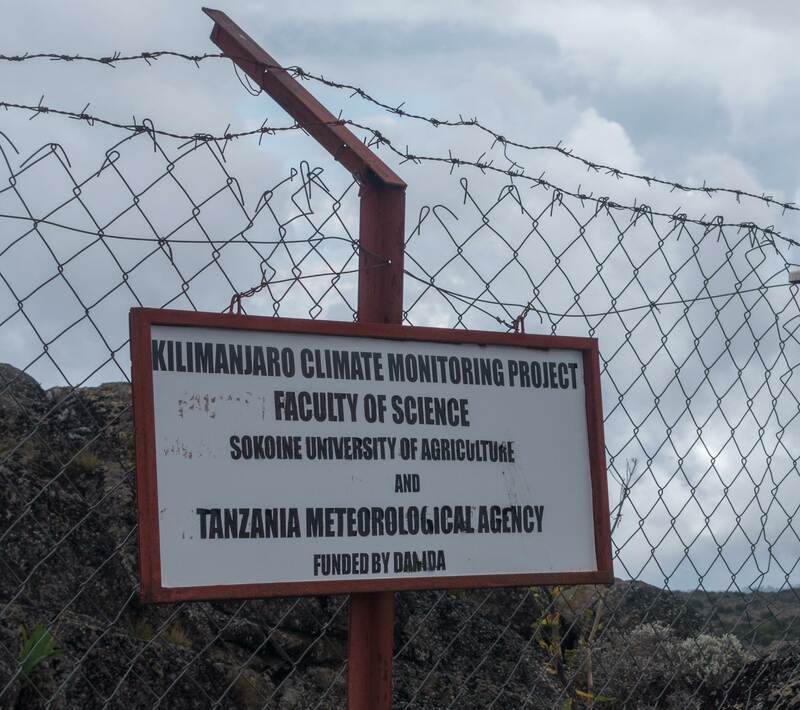 It is apparently one of three maintained on the slopes of Kilimanjaro though I did not see any other stations, not even up on the summit plateau, where the rapid disappearance of the glaciers is a real cause for concern. 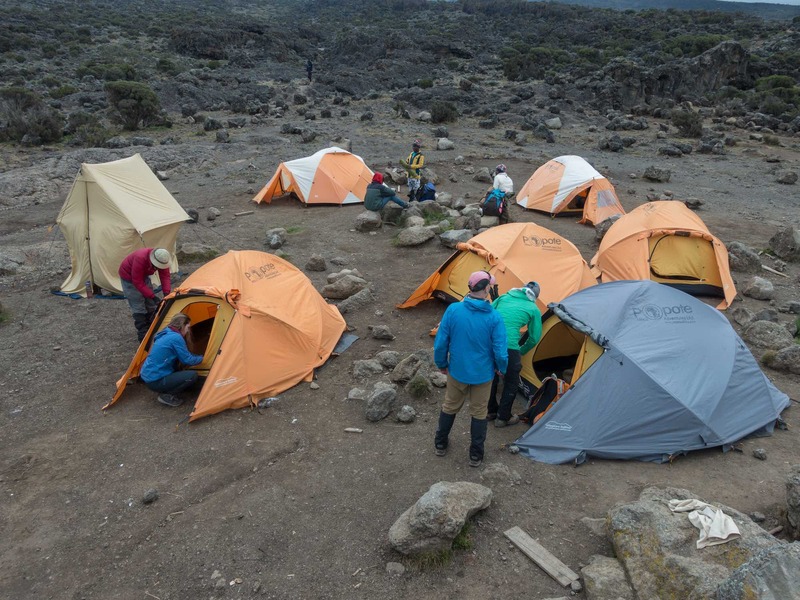 Given our noon arrival at Shira 2, we had lunch shortly afterwards in the dining tent and then some time to ourselves before we set off on a mid-afternoon hike for acclimatization purposes. We walked up the same path that we would take the next morning on our way to Lava Tower. According to my GPS tracker, we got as high as 4005 meters, about 200 higher than our campsite. We sat on the lava rocks and took in the scene below us for a while. Shira 2 is in the foreground in the image below; the jagged southern rim of the old Shira volcano is in the background. On our return to camp, we had some siesta time before tea time at 4:00. Then it was more relaxation time until supper at 6:00. Meanwhile, it was getting dark and colder. This would be the night that George and Fella, the two Popote crew members who took care of us at meal time, filled our Nalgene bottles with hot water to take inside our sleeping bags! A couple of us had shivered through part of the night at Shira 1. The water bottles would prove to be a big hit! A quick recording of the oximeter results from each trekker and it was time to crawl into our tents – Day 3 was in the books!